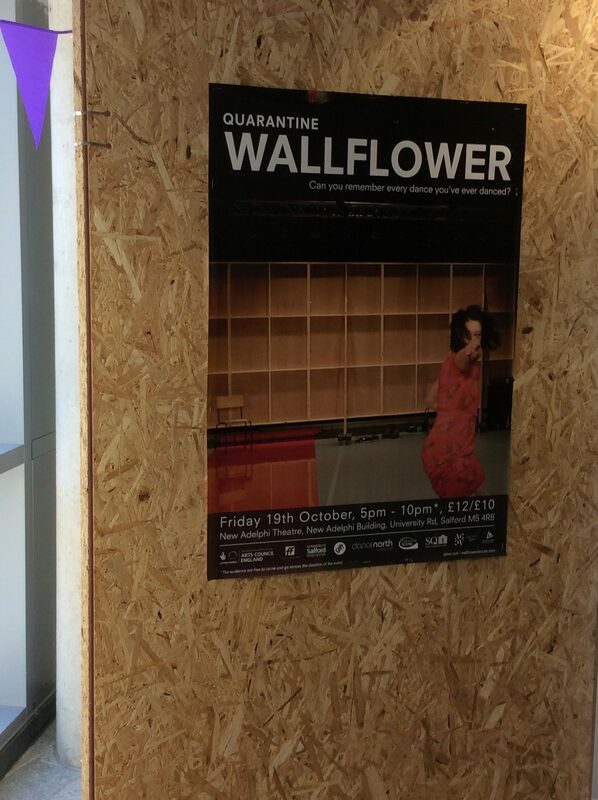 On Wednesday last week we were visited by Kate and Sarah from Quarantine, who are bringing the company’s latest show ‘Wallflower’, to the New Adelphi Theatre on Friday 19th October (details here: http://www.wallflowerdances.com/). The concept of the show is that the performers will be trying to remember every dance they’ve ever danced, and, to aid them in this enquiry, Kate and Sarah have been interviewing people local to each performance to share their memories of dancing. These conversations are then added to what is becoming a delightful online archive with portraits of the interviewees. As we met in the same studio we’d been rehearsing in the day previously, Kate and Sarah were particularly interested in finding out about our current dance together – and this turned into a great opportunity to have some time reflecting on our piece, whilst being interviewed separately, yet within earshot! I was particularly impressed by Sarie talking about how she feels this dance in the top of her spine, where her movement ideas become actualised. For my part I found myself exploring ideas about what I see in the dance – not only my awareness of the external space we create in, but also the inner, imaginative space that I’m coming to realise is so crucial for modulating movement quality. To top it all we laid on an impromptu performance of the final section of the piece – complete with our set which was literally outside the door – rather more than was bargained for! Thanks to Kate and Sarah for their thought-provoking questions and we wish you well for the Salford performance and the rest of the tour!